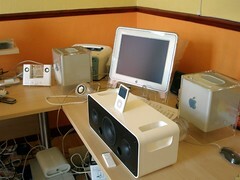 One of the more controversial products that Apple recently launched is the aptly named iPod Hi-Fi. We at the TechCast Network have managed to get our hands on one so we can put it through its paces. Lifting the unit out of the box for the first time did surprise me as the size of this unit is just much bigger than any other iPod docking system out there. The word portable is a loose-fit! However it is portable because it’s got nice solid carrying handles at the side and can run on 8 D-cell batteries and in that scenario you’re talking about the best part of an 8 kg system. We didn’t really test the portable side; we just wanted to know whether they’re any good. Truth is we’ve got some mixed results. I’ll talk about the design first. The whole unit measures in at 43.2 x 16.8 x 17.5. The sheer size and style of it makes you think that itï¿½ï¿½ï¿½s going to have a lot of bang for its buck. 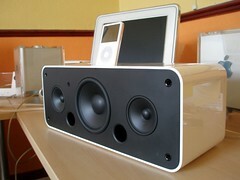 The same standard Apple Remote is included as well as a speaker grille and the various different docking plates for all the different iPods past and present (can be used with other audio sources using Line In). Since our review unit didn’t come with a grille we tested it as it was. It looks good without a speaker grille anyway and general rule of thumb is that the sound is also marginally better without a grille. The only buttons youï¿½ï¿½ï¿½ll find on the unit are the volume up and volume down keys and even these are touch-sensitive. The casing is a double-walled plastic shell that has been reinforced to prevent unwanted vibrations and resonance from the speakers themselves. The completely sealed unit also avoids any external interference which may cause buzzing noises to be channelled through the speakers. I’m no audiophile but research on other systems show that Apple certainly didn’t skimp on the hardware. For Â£249 you get three speaker cones containing two 80-mm tweeters for left and right wide-range audio and one 130-mm woofer for all your low tones and bass reproduction with a maximum decibel rating at 108dB. If you’re running the latest software on your iPod then you’ll have access to the Speaker menu. Basic functionality is unlocked here with the ability to control things like the Bass, Treble and whether the screen displays full-screen album art or not. On the back you have access to the battery compartment which can house 8 D-Cell batteries. There’s also the power lead and just one other connector. The line in accepts both 3.5mm standard audio jacks as well as S/PDIF optical connectors. What this means for us is the ability to stream wireless audio to the iPod Hi-Fi using Apple AirPort Express; Apples proprietary wireless media adapter. One thing you might find missing is computer connectivity. 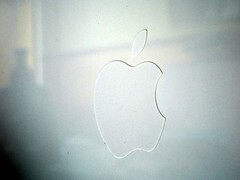 Apple have decided to skip this feature assuming that most users who go for this system will be placing it in a room without access to the computer or wont be near to it. A reasonable assumption to make since these speakers aren’t exactly what you’d want sitting next to your monitor. The supplied remote control is similar to all of the other infra-red remotes that Apple ships with products like the iMac and Mac Mini. Same exact buttons and layout, only the Menu button controls the ability to switch between feeding audio from the iPod dock or the auxiliary in. It would have been nice to be able to actually control the iPod menu system and be able to navigate the iPod using the remote but no such luck this time. So what does it sound like, you ask? 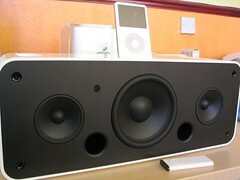 The included Apple instructions advise that you place these speakers as close to ear level as possible. Not always possible but I have to admit despite my reservations that I made in my podcast review, I do think the sound is rich, bold bass and just at the right level, no wonder Apple didn’t want us messing with equalizer settings. Everything is ready to go straight out of the box, no installation or assembly required. When you whack this thing right up you don’t get room-filling sound, you get pure ground-shaking sound. The bass stomps on your floors and the treble cries in to your ears. It’s perfect for parties or if you like to create a rock concert in your own home then you’ve found the ideal setup for it. It’s not just that though. If you want to listen to it quietly, the quality is uncompromised. You still get that high-fidelity audio that Steve Jobs himself promised on-stage. It’s perfect for all environments, moods and types of audio. The word that’s going around is that classical music doesn’t work too well on it. Rich has to disagree with that. At 102dB there’s more than enough of distortion-free volume to make the neighbours complain. Apart from the usual music tests which this setup was designed for. I was curious as to how it would sound in a home theatre environment. So using the lineout on my LG 26LX2R LCD screen and in to the Line In on the iPod Hi-Fi I played a couple of movies through it. 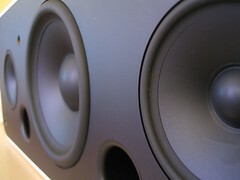 In Chronicles of Narnia, the bass and dramatic scenes really showed of these speakers. The sound was crystal clear and brought me back to an actual cinema. Perfect Match without all the action and stomping noises was a stark contrast but none the less the iPod Hi-Fi proved itself to be a winner. Voice and music came out loud and clear yet again with bass in all of the appropriate places and enough volume to recreate the home theatre environment (naturally without the surround sound – but who wants all those wires anyway). So if this unit is going in the living room then this is perfect for you. Not only have you got an iPod docking station for you to play your music through you’ve also got a more than capable cinema speaker system. I have to agree with Rich on this. He really liked the sound from the start. I wasn’t too much of a fan but wasn’t exactly disappointed. These speakers do grow on you and the £249 price tag, whilst does seem steep, it’s got flexibility and packs some serious stereo in to a portable boom box that works in any room and of course, features the engineering excellence that you always get from Apple.